With the development of optical communication technologies, people are entering into the new era of information. In order to overcome the data rate limitation of traditional communication system, WDM and OTDM technologies are typically used to increase fiber optic bandwidth. However, no matter which kind of technology is adopted to construct fiber optic network, optical add-drop multiplexer (OADM) technology is needed in the system. It makes the fiber optic network more flexible, optional and transparent. OADM is now a key component of the all-optical network to enhance the network reliability and efficiency. This article will give a brief introduction about the basic knowledge of OADM. 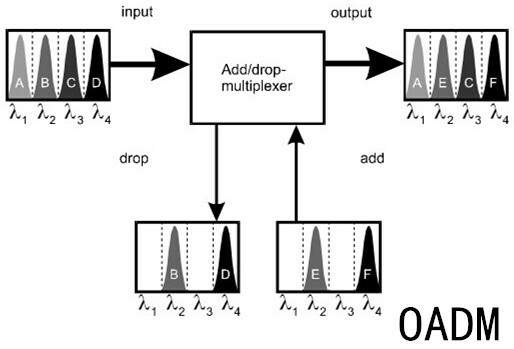 So what is an optical add-drop multiplexer or OADM? To be specific, an OADM is a device used in wavelength-division multiplexing systems for multiplexing and routing different channels of light into or out of a single-mode fiber. “Add” refers to the capability of the device to add one or more new wavelength channels to an existing multi-wavelength WDM signal. On the contrary, “drop” refers to its ability of removing one or more channels and passing those signals to another network path. There are three parts of a traditional OADM – an optical demultiplexer, an optical multiplexer and a reconfiguration method between the demultiplexer and the multiplexer. The demultiplexer separates wavelengths from an input fiber onto different ports. The multiplexer multiplexes the wavelength channels that come from demultiplexer ports with those from the add ports onto a single output fiber. The reconfiguration can be achieved by a fiber patch panel or by optical switches which direct the wavelengths to the multiplexer or to drop ports. The WDM signal contains multiple wavelength channels. When these wavelengths enter into the main input of OADM, they can be selected to enter the drop output ports according to your application requirements. Correspondingly, the add ports will input the required wavelength channels. And those irrelevant wavelengths will directly pass through OADM and then be multiplexed with the added wavelengths together leaving the main output. Therefore, the function of OADM is to download necessary local signals and upload signals for the user of next node. Fixed OADM and reconfigurable OADM are two commonly used types of OADM. The former is used to drop or add data signals on dedicated WDM channels, and the latter is used to electronically alter the selected channel routing through the optical network. Fixed OADM or FOADM is the traditional construction of OADM. It uses a filter to select a dropping wavelength and a multiplexer to add a new channel at the same wavelength. Different from FOADM, reconfigurable OADM or ROADM is a dynamic type which has the ability to remotely switch traffic from a WDM system at the wavelength layer. It provides flexibility in rerouting optical streams, avoids faculty connections, and allows minimal service disruption and the ability to adapt or upgrade the optical network to different WDM technologies. OADM is an important element of an optical fiber network. It can be both deployed for long-haul core networks or short metro networks. Fixed OADM and reconfiguration OADM are two commonly used types. A further development of OADM is absolutely the future trend in fiber optic communications.